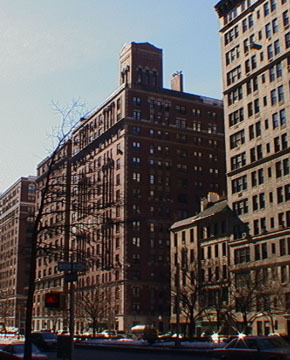 A typical Park Avenue apartment building of its era, this 16-story building was completed in 1928 and designed by Schwartz & Gross, one of the most prolific designers of luxury apartment buildings of the period. The firm's other Park Avenue buildings include 470, 525, 885, 888, 910, 911, 930, 941, 983, 1095, 1125 and 1165. The red-brick building was converted to a cooperative in 1951 and has 70 apartments. Its location is at the heart of the Carnegie Hill neighborhood. It is close to numerous religious and cultural institutions and private schools and there is good public transportation and shopping. It has a canopied entrance with a doorman and sidewalk landscaping, but no garage and no health club.